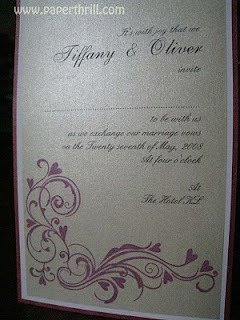 The phrase 'Two lives, two hearts' inspired us to create this beautiful handmade wedding invitation. 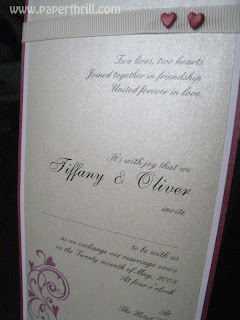 In line with the theme, we included 2 red heartshape brats above the phrase as a symbolic meaning to the bride and groom. 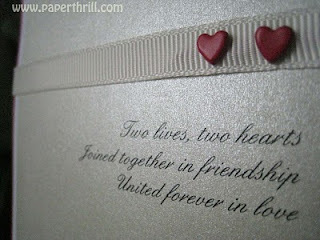 Red love vines were handstamped onto a pearlescent paper and then layered on top of another white pearlescent card. 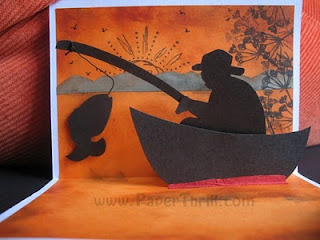 A red colour cardstock was used as a base. For added charm, a beige grosgrain was wrapped around the card.